The Mars Rover has taken a pitstop on mars after a solid….2 MONTHS OF DRIVING! I mean seriously, why don’t they make cars out of this kind of stuff, then there would be no more need for breakdowns in the middle of winter! (Can you tell I’m bitter?). The Nasa robot will be using just its remote-sensing instruments. There is no expectation to drill. 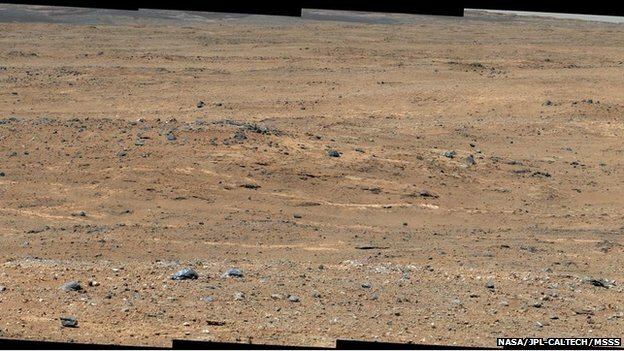 Curiosity plans to make five such stop-overs as it pushes forward to the foothills of Mount Sharp, the big peak that dominates equatorial Gale Crater. Project scientist Prof John Grotzinger told BBC News the rover would be at its current location for “a few sols only”. A sol is a Martian day, which is 39 minutes longer than an Earth day. A little known fact that Mars days are called “sols”. Because of the greater distance from the sun…..duh! Still I’ve always wondered how after travelling all that way, the difference is only 39 minutes, I mean the time difference between the UK and France is more than that! Right? Right! Some may say this is not as interesting as the frog that photobombed the NASA launch, but hey, it’s up there. Anyway, here is a cool video on the Mars Rover Curiosity, Enjoy! You can always checkout our starglo blog.